Since the New 52 initiative at DC Comics and the renumbering of all their classic titles, it was bound to happen: another twenty-seventh issue of “Detective Comics” was an inevitability. Why is “27” such an important number for this title? Batman first appeared in “Detective Comics” #27 in 1939. This year just happens to be the seventy-fifth anniversary of Bill Finger and Bob Kane’s creation, making the release of 2014’s issue 27 of “Detective” an excellent way to begin celebrating Batman and his impact on comic books and the culture at large. With no doubt countless writers and artists clamoring to be a part of this special issue, DC got talent currently working on the Bat-books to contribute, as well as some classic creators that have contributed to the Bat-mythos over the years. 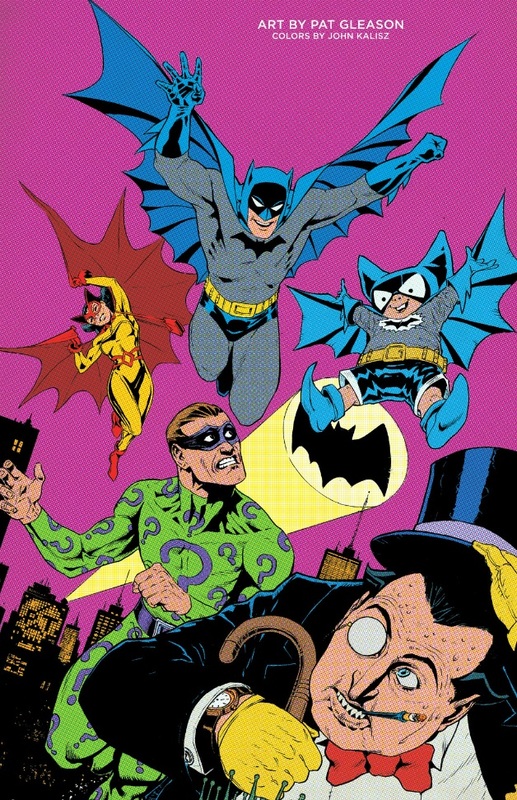 The creators involved in this issue understand the complexity of the character and have each created a love letter to the Caped Crusader in these seven stories (as well as pin-ups by various artists sprinkled between stories). Certain themes resonate through all the stories, some more than others. Bruce Wayne’s humanity shines through, as well as the idea that, although he may be human, he is a “super” human in more ways than one. Batman is an ever-evolving character and one that has survived for a reason over such a long period of history. The first story in this hefty issue is written by Brad Meltzer and is told with gorgeous artwork by Bryan Hitch. It’s titled “The Case of the Crime Syndicate”, which should be recognizable to Bat-lovers because it was the title of Batman’s first adventure in the 1939 “Detective” #27. Instead of re-telling the classic story, Meltzer and Hitch put their own twist on the old yarn and show a novice crimefighter contemplating why he must be Batman as he takes care of business. The action depicted by Hitch is phenomenal, with Batman truly portrayed as a mythical and larger-than-life character. The plot is not as important as the voice of Bruce Wayne. Throughout the story we get voice-over from Bruce as he states reasons why he must be Batman. Some may find it sentimental, but every word is true that comes from Meltzer’s pen. Some of the reasons for Batman, according to Bruce: he has “no choice”; “it transforms me”; “masks my pain” (with a beautiful close-up of Batman’s mask as these words are shown); “people need me”; and “the world needs heroes”. One of Bruce’s reasons highlights a loss of innocence that is integral to Batman: he “can’t go to the movies anymore”. I won’t ruin the reason stated when Batman finally makes his entrance in the story, but wow, that entrance is pretty cool. The next story, “Old School”, is written by Gregg Hurwitz and features the art of legendary Bat-artist Neal Adams. 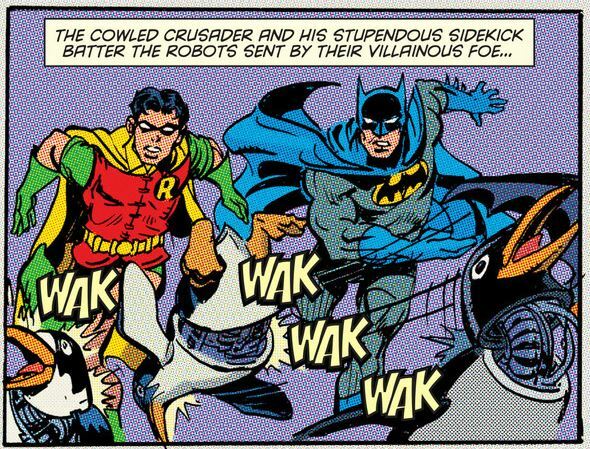 It’s a fun story, with certain “old school” artistic elements from comic days gone by that playfully poke fun at and show how Batman (and comic books in general) have evolved over the last seventy five years. The story is a clever riff on the immortality of the Batman character, with Adams definitely understanding what Hurwitz is trying to do with his story. Adams’ art is, at times, not “Adams”-esque, which fits perfectly with what the story is trying to say: Batman must evolve if he is to stay relevant. According to Hurwitz and Adams, Batman’s evolution is reflected in his rich history. “Better Days” is the first story of this collection that shines a light on the future of Bruce Wayne. Here, Bruce is celebrating his 75th birthday in a story written by Peter J. Tomasi, with art supplied by Ian Bertram. Family is definitely an integral part of Batman’s life, with age rarely discussed or portrayed (“The Dark Knight Returns” and “Batman Beyond” notwithstanding). In this story, there’s a fun and pretty breathtaking scene that is a loving homage to a classic Bat-book that will definitely give readers a thrill. Bertram and colorist Dave Stewart, in this scene and throughout the short story, display artistic prowess. Bertram’s art is reminiscent of Chris Burnham and Nick Pitarra, but that’s definitely not a complaint or a put-down towards his own artistic originality. His facial features are hilarious at times, lending levity to a story that could have been a downer. Stewart’s colors beautifully complement Bertram’s art, and I, for one, want to see Bertram do more work in the Bat-universe. Coloring is an integral part to the next story as well. Francesco Francavilla supplies the story and art to this short four page story that is simply titled “Hero”. From the opening rainy night setting, the distinctly unique art and coloring of Francavilla bursts off the page. Batman’s effect on the past of a certain character that shall not be named is explored in just this one scene that demonstrates the effect Batman has on the people he comes into contact with on a nightly basis. Coloring and shadow add to the ominous nature of the story and is fitting for the character who is not just integral to Batman, but to others in his “family”. The weakest of all the tales in this Bat-extravaganza is “The Sacrifice” by renowned Bat-writer Mike Barr and artist Guillem March. 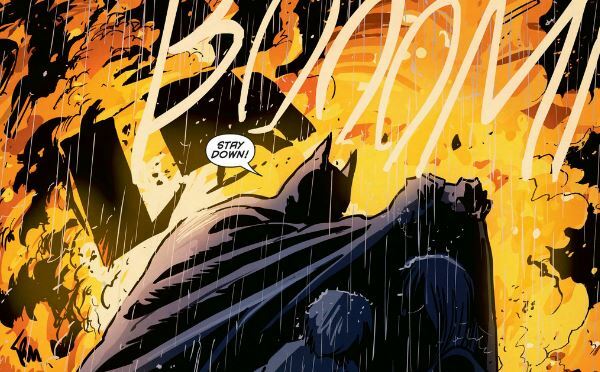 Even though the story has a terrific premise of Bruce Wayne having to face the sacrifices he has had to make as Batman, the dialogue can seem stilted at times. The art by March seems to be rushed in some scenes, despite having a large and beautifully expressive face of a young Bruce Wayne in one particular scene. A guest star in this short story helps Bruce realize he has obviously sacrificed a normal life to become a legend. The current “Detective Comics” team of writer John Layman and artist Jason Fabok begin their last story arc of their run entitled “Gothtopia”. The story begins with a Batman and Catwoman that are drastically different than what we’re accustomed to in the current continuity. Is this an Elseworlds story? What, you will ask, is going on here? Layman has Batman discover that not all is what it seems by using his skills as the world’s greatest detective. Fabok has a style reminiscent of Tony Daniel, yet a distinct and realistic style (despite the somewhat outlandish premise) that is enhanced by Tomeu Morey’s beautifully muted colors. The only distraction to the story are the costumes for certain characters, yet they exist that way for humorous reasons. The final scene will whet the reader’s appetite for the resolution to the deliciously fun beginning of the final story that Layman and Fabok are telling with their “Detective Comics” run. The best story is definitely saved for last. 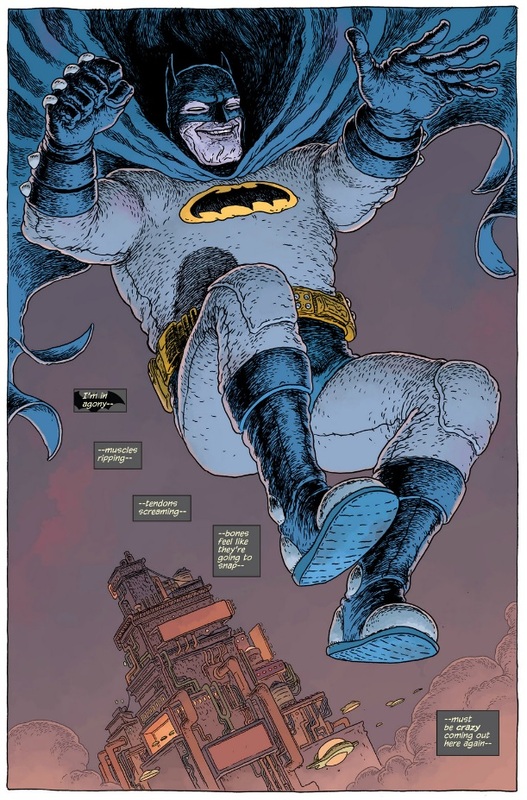 Writer Scott Snyder, artist Sean Murphy, and colorist Matt Hollingsworth create a future for Batman that Snyder has said would be how he and artist Greg Capullo would end their run on the “Batman” title. Inspired by the brilliant “Batman: Year 100” by Paul Pope (as he’s stated in interviews), Snyder has created a story that gets to the essence of Batman. Bruce Wayne is driven to keep the mythology of the Bat alive and, of course, he does it. Like Francavilla before him in this issue, Murphy has a unique style that takes one’s breath away. The attention to detail in every inch of his artwork, including characters, facial expressions, cityscapes, and vehicles, demonstrate the love for and belief in Snyder’s story (as well as every other story he illustrates, including his own). Even those averse to science fiction will find this tale a fitting future for the Caped Crusader, with Snyder and Murphy presenting the lengths Bruce would go to in order to protect his city. Batman is more than just Bruce Wayne the man. Batman is a legacy and a myth that must endure. After finishing this story and this issue, Batman is shown to be alive, well, and forever. To paraphrase the Scottish wordsmith Grant Morrison, Batman will never die. 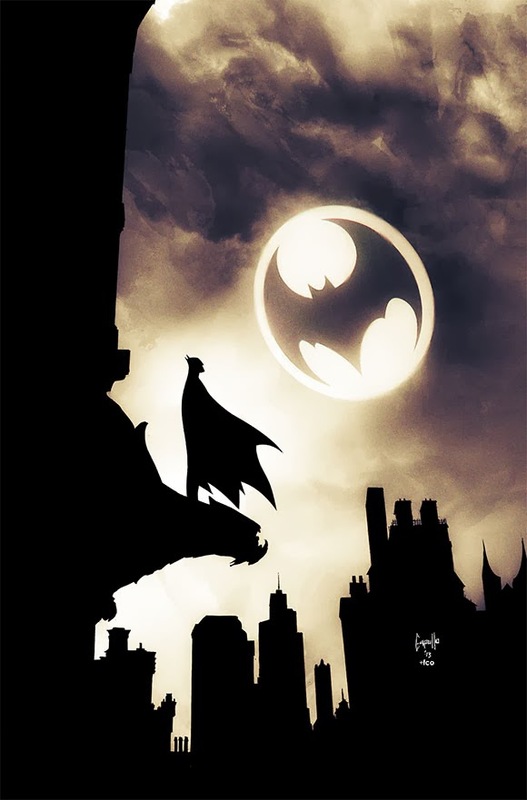 As exhibited in this fitting tribute to the longevity of an American myth that has become a global myth, Batman is a character who will survive because of both his rich history and vast untapped future. Although he may be human, Batman will, as shown in this anniversary issue, survive decades and, most assuredly, centuries. Each one of us may have our idea of who Batman is and should be, yet we can be open to the possibilities that are endless for an icon who is adaptable yet remains who he is at his core throughout his varied incarnations. One of the many Bat-tastic pin-ups from this very special issue!